This crazy looking glass dome was built to honor the memory of Brazilian social activist Dr. Ruth Cardoso. Designed by São Paulo-based firm, Decio Tozzi, the Orchidarium Professor Ruth Cardoso is a highly controlled environment specifically designed for growing orchids with the perfect the amount of light, humidity, temperature and air movement. As such, the diaphanous hut is naturally daylit with a concrete spine to control ventilation into the space. Recently completed in 2010, the Orchidarium is located in the Villa-Lobos Park in Brazil and can be accessed via a gently sloping ramp. Buried 1.5 meters below the surface, the bottom part of the dome is protected from the environment. 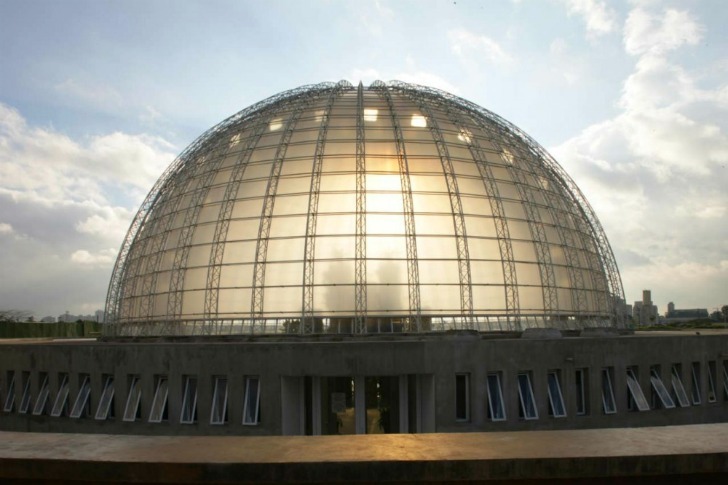 A body of water surrounds the building and is held at bay by a large concrete wall, making the dome seem as though it were submerged in water. The steel, glass and concrete building was designed to provide optimum interior conditions for growing orchids. Inside, the space is filled with diffuse, gentle light reminiscent of the quality of daylighting found in the orchids’ natural habitats. The concrete spine that separates the dome in half is responsible for the ventilation control necessary for the orchids’ delicate environment. Professor Ruth Cardoso was an anthropologist who studied primitive cultures and worked to combat poverty and social exclusion in Brazil. The Orchidarium is dedicated to this forward-looking visionary, who is currently the President of the Comunidade Solidaria program, and a member of the Board of the United Nations Foundation. As a Mad Scientist wannabe, I full approve of this building. I want my secret lair designed to look like this. Recently completed in 2010, the Orchidarium is located in the Villa-Lobos Park in Brazil and can be accessed via a gently sloping ramp. Buried 1.5 meters below the surface, the bottom part of the dome is protected from the environment. 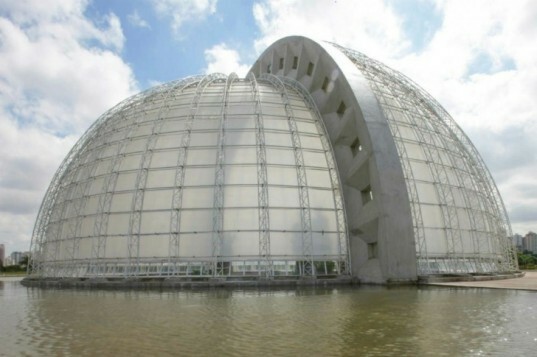 A body of water surrounds the building and is held at bay by a large concrete wall, making the dome seem as though it were submerged in water. A cantilevered platform over a sunken area near the Orchidarium. The entrance to the Orchidarium. The steel, glass and concrete building was designed to provide optimum interior conditions for growing orchids. Inside, the space is filled with diffuse, gentle light reminiscent of the quality of daylighting found in the orchids' natural habitats. As the sun sets, daylight fills the space with a glowing light. Looking straight up from inside the building to the center of the dome. The concrete spine that separates the dome in half is responsible for the ventilation control necessary for the orchids' delicate environment. Delicate plants inside the dome. Floor plan of the Orchidarium. Cross section of the Orchidarium.